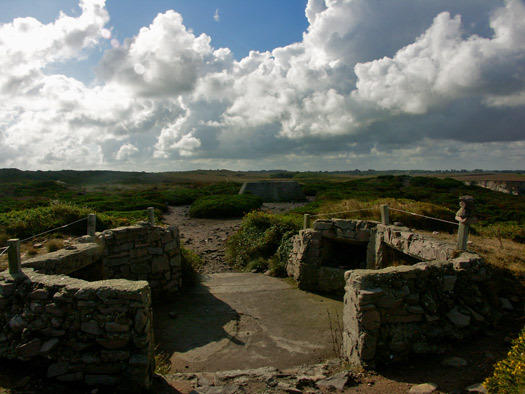 La318 Cap Frehel Pointe du Jas, Luftwaffe Kriegsmarine station 'Froch', K.V.U.Gruppe Lamballe. La318 Cap Frehel Pointe du Jas. 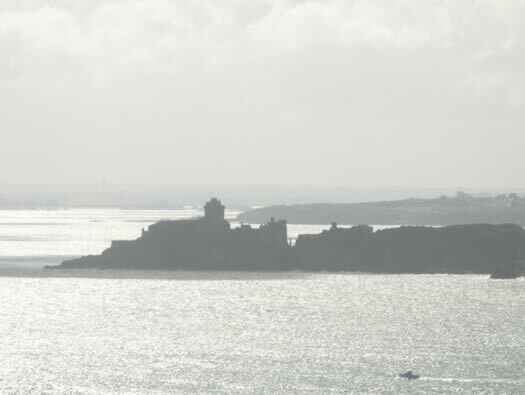 Cap Frehel is located to the west of St Malo/Dinard (40km). 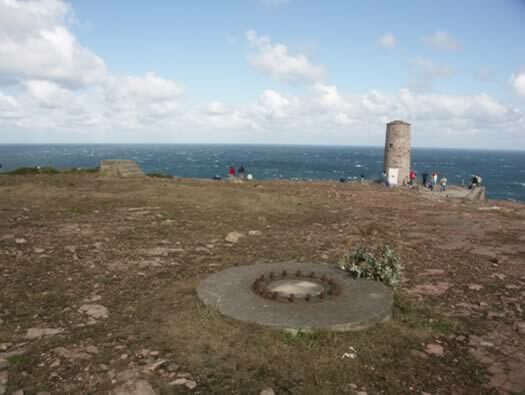 A point of land with three fingers jutting out into the Atlantic Ocean with the radar code named 'Froch' on the left, the light house in the centre and Fort La Latte on the right. 1 x 2cm Flak Vierl. 1 x Mammut Fu.MG 52. 1 x Freya Fu.MG. 401. 1 x Würzburg Anton 39(t) D.
1 x Fu.MG Seetakt Geme Fu.M.O.2. Of the three fingers the main one we are interested in here is on the left. 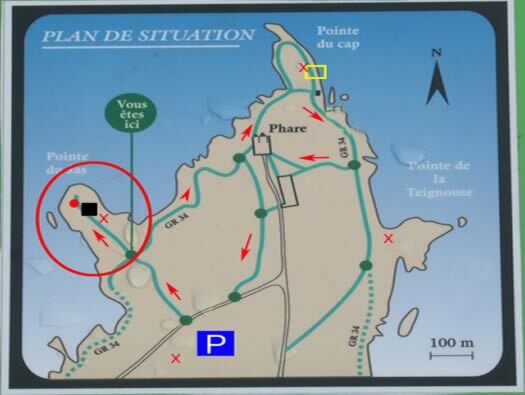 We parked in the road opposite the path to Pointe de Jas GR34 and walked the route of the red arrows. Cap less, the view from the Cap. 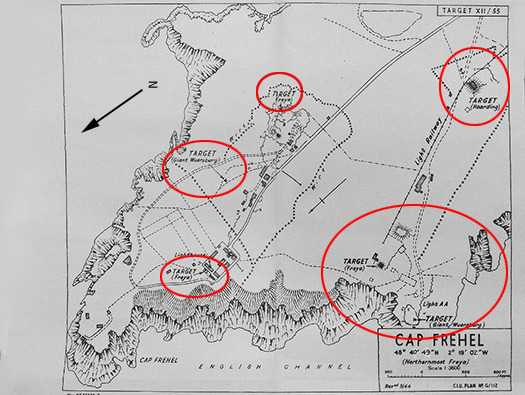 An allied plan from Air 40/1667 of the radars at Cap Frehel. This was a document assembled for the run up to D-Day showing all the radars that needed either allowing to work or ones needing attacking all to do with the deception planning. There is still more to find. Photo reconnaissance Spitfire that went out day after day taking photos of almost the whole of Europe. No guns just its speed to get out of trouble.. The ladies of Medmenham where all the photos were interpreted. 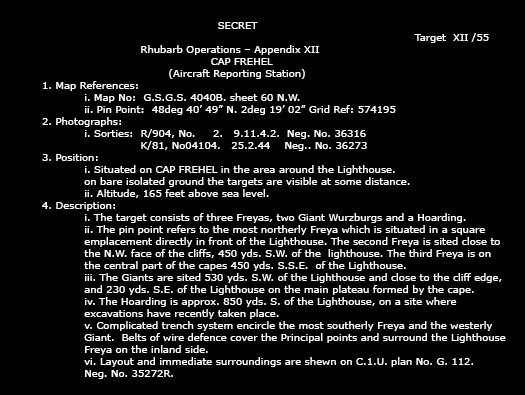 Allied details about Cap Frehel radars. 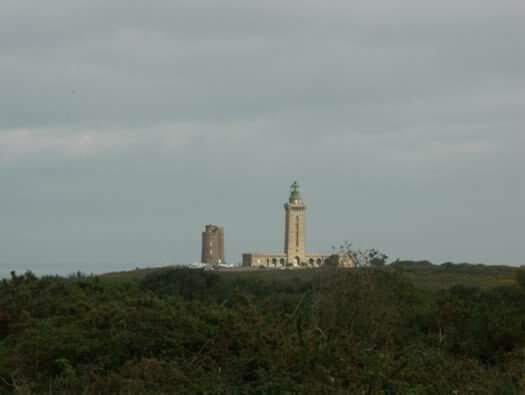 This is a 130 page document on radars from Dunkirk to western Brittany. An air photagraph of the Cap taken in February 1944. 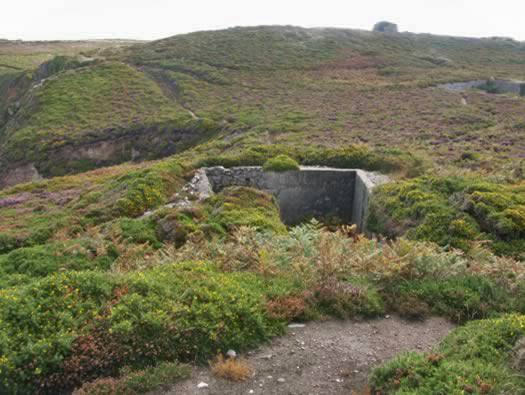 L479 Bunker for Night Fighter Control 'Anton'. 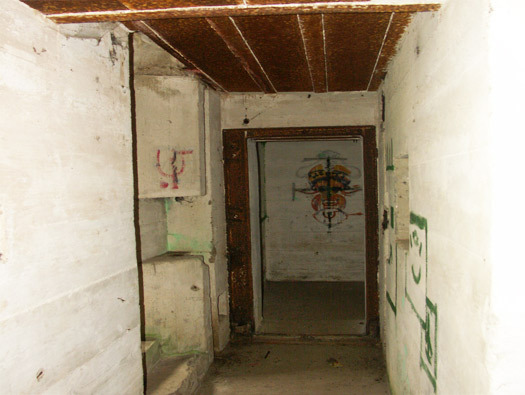 Arrowed is the entrance to an L479 bunker. 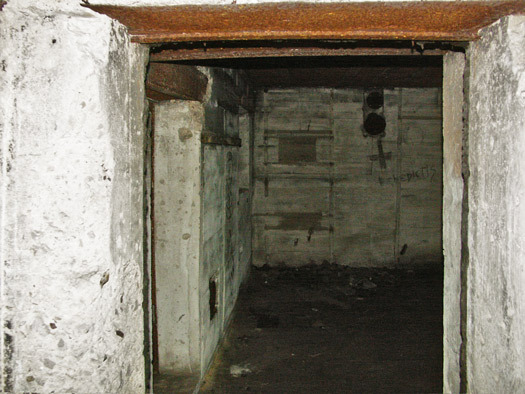 This is a vast bunker on two levels with two entrances & two machinery entrances. L479 Night Fighter Control 'Anton' Bunker. First opening is a re cooling vent. 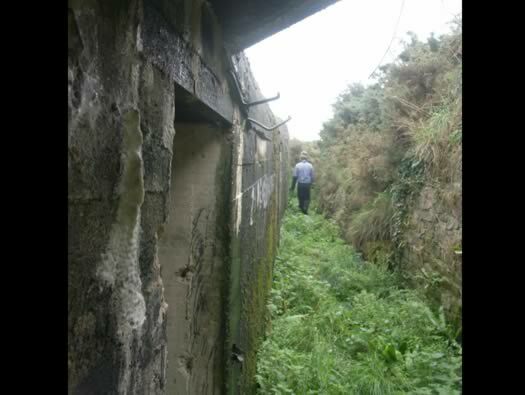 The second is the entrance up to a defence Tobruk. 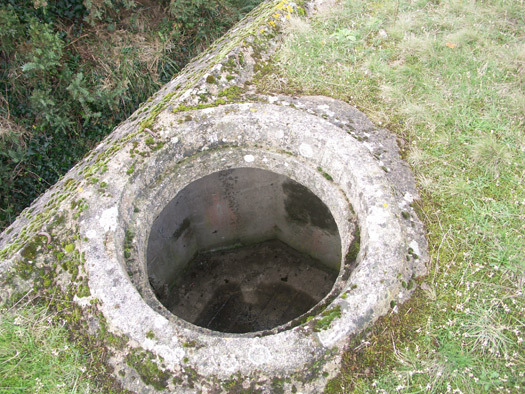 It looks like this type with a centre post to take the weight of the machine gun. View through the hole Inset. 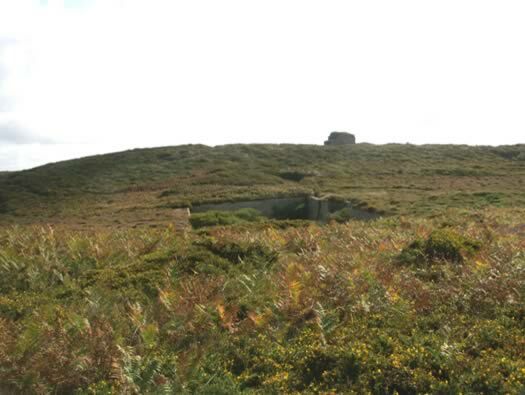 This was a massive bunker about four to six times the size of an R622 (which we will see later), on two levels with a large double height room for a night fighter control room. 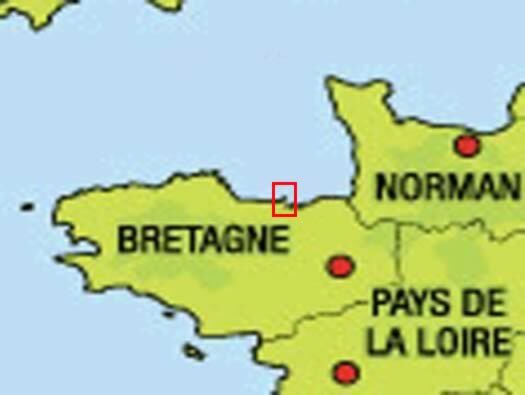 Bombers would fly down from airfields in England to bomb the U-Boat bunkers at Brest, Lorient, St Nazaire and La Palace. 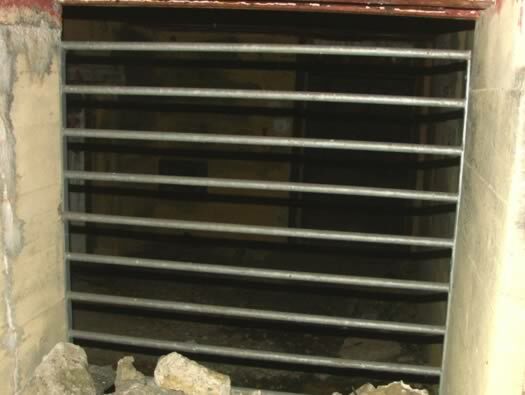 Another machinery entrance with iron bars stopping entry. 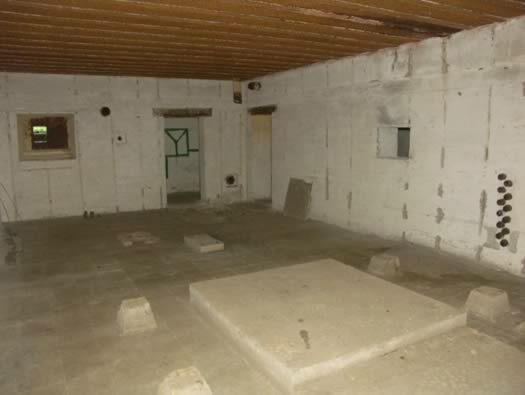 A picture of an L479 bunker model showing all the rooms and levels. Happy drome a British fighter control room, not that much different to an L479. 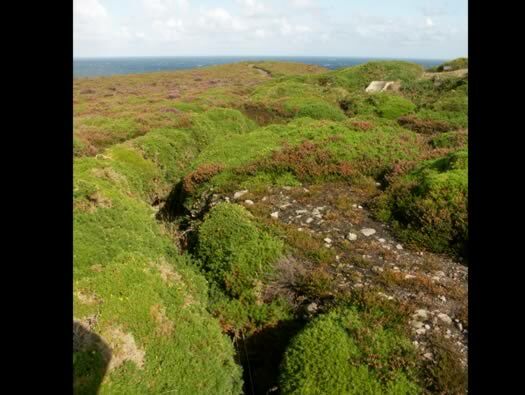 A trench system and small local built bunker. 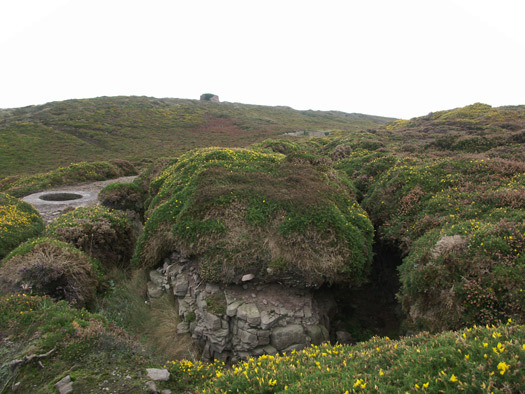 A Large Hole in the Heather. 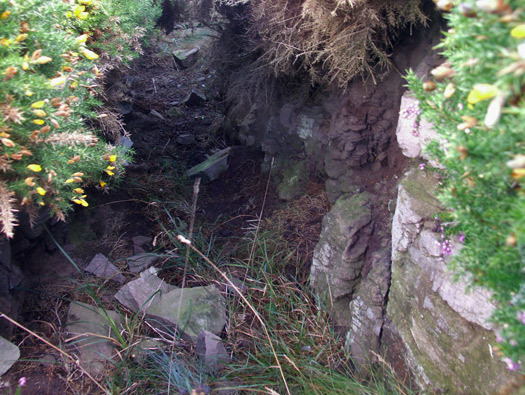 A very large hole with concrete retaining walls. 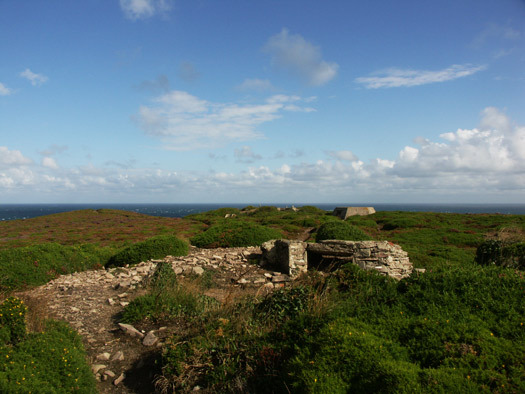 The consensus is that it housed some large wooden huts?. 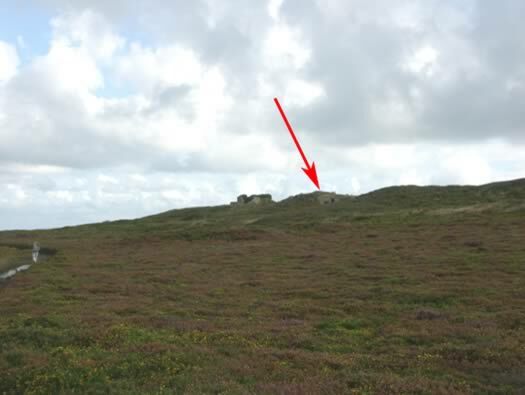 Possibly a large hut or several small ones either for troop accommodation or to do with the radars in this area? Some RAF wooden huts very like the ones that could have been here. One of the sets of steps. 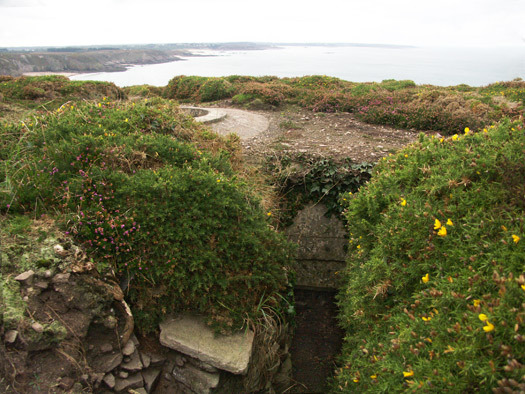 Trenches cut into the rock. 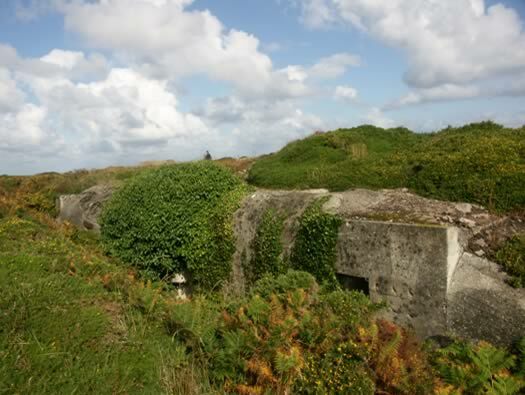 R622: 152 were built in the AOK7 area with two crew rooms a gas lock and a Tobruk defence. 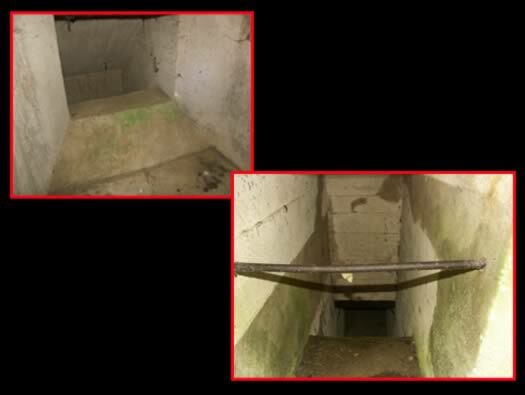 The steps down with a close combat embrasure covering the entrance and the main picture is the gas lock area. The close combat defence window covering the entrance steps. Some of the internal pipe work still in place and communication wires coming out of the floor. 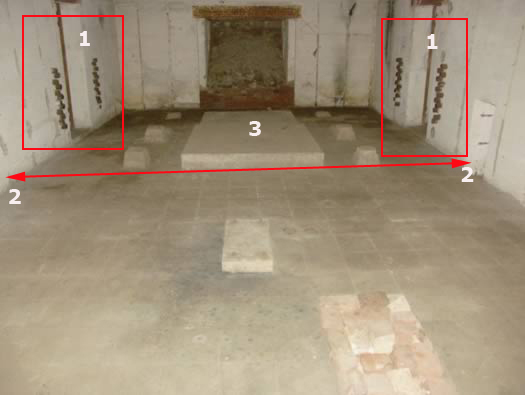 Fittings on the right for the ventilation. 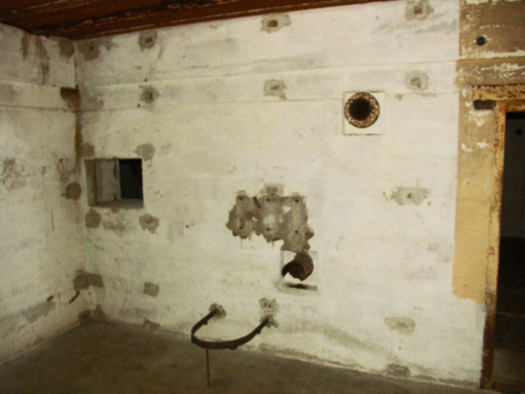 Looking from the left to the right hand room with what looks like communications board fittings on the far wall and the chimney for a heater. 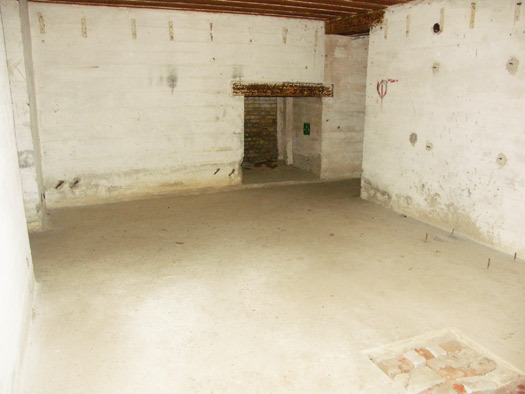 The right hand room with the close combat defence window. Wooden covering on the far wall. The chimney pipes on the right and hoops in tie ceiling for the air pipes. Air pipes in the other room with hoops holding them up to the ceiling. 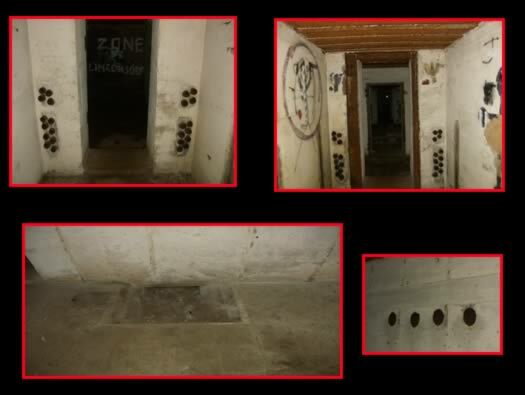 19P7 doors used inside the bunker. 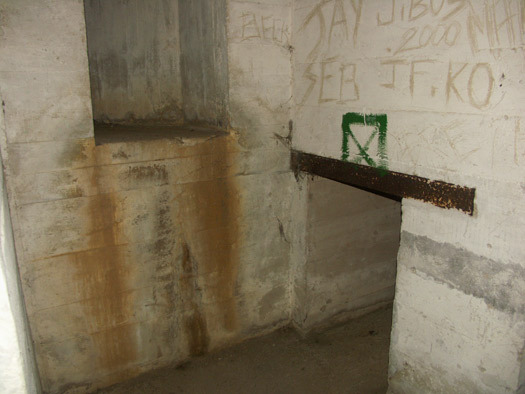 The second set of entrance stairs still with the original paint on the wall. There are lots of bits with no regular designs but all look to be part of the defence. Behind is a V226 radar socket. 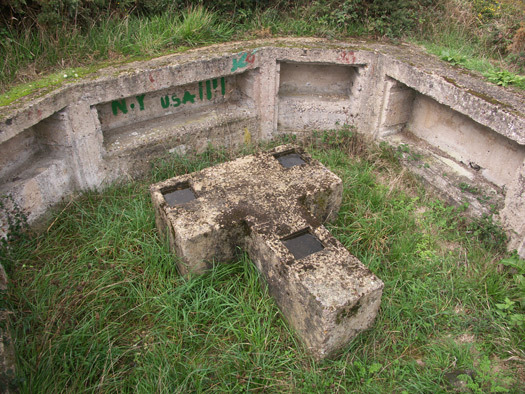 Würzburg radar socket for a Würzburg Riese Fu.SE 65. Würzburg radar better known to the Allies as Giant Würzburg. 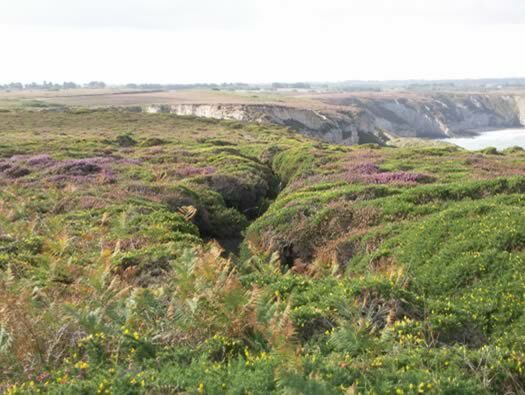 And a trench running through the heather. 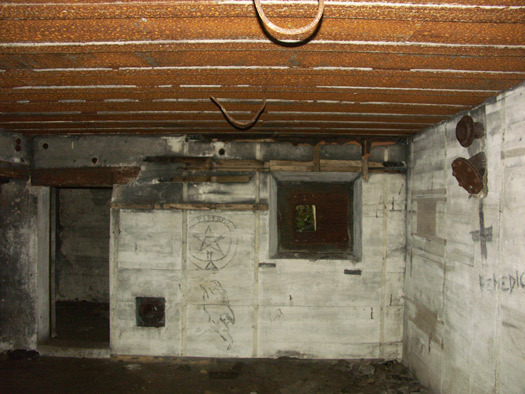 Inside a damaged cabin on a Würzburg radar. Views in and around the V229 radar socket. More Trenches as we Walk Around. 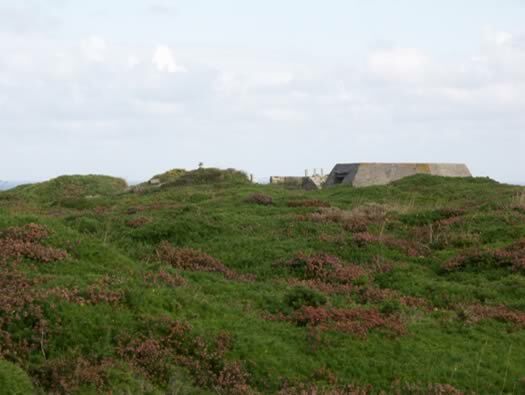 Yellow lines are the trenches I can see, red dots Tobruk's. A small but very effective anti-aircraft gun. Layouts of bases for 2cm Flak. Locally built of concrete and stone from the excavated rock. 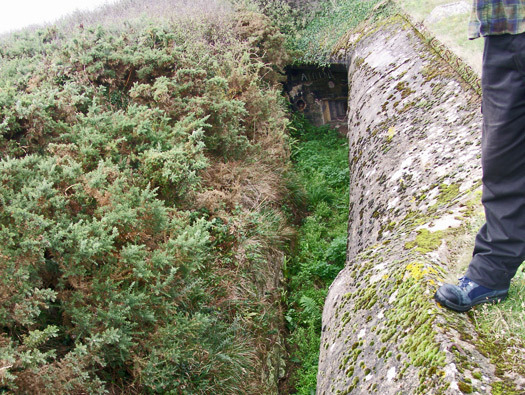 Part of the trench system. 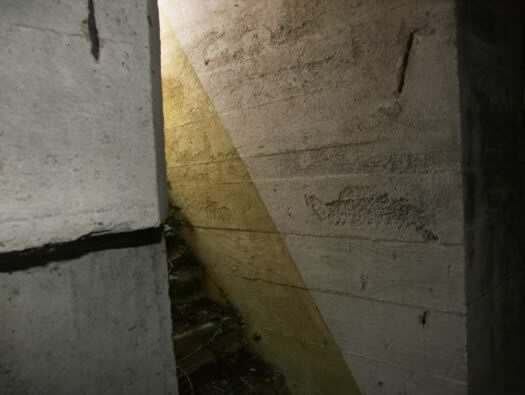 Its a trench bridge where a path crossed a trench and a large concrete slap was placed. 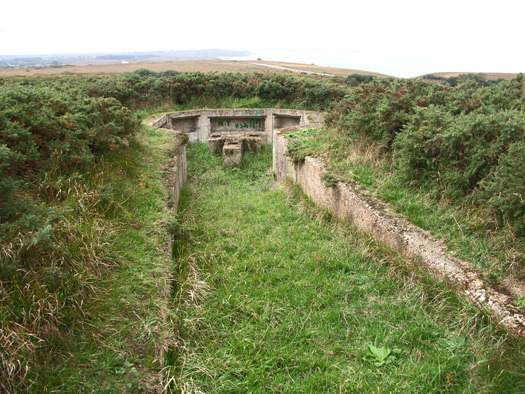 Part of the trench system. By September it was all over. 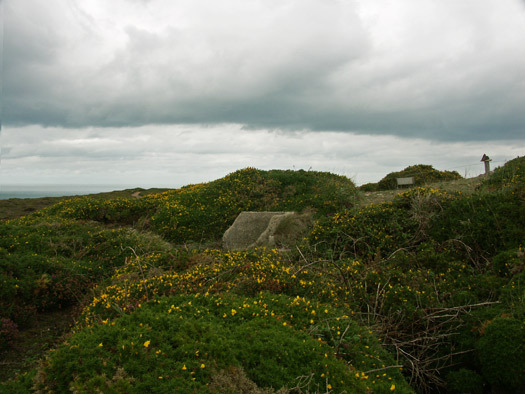 View along the Trench. 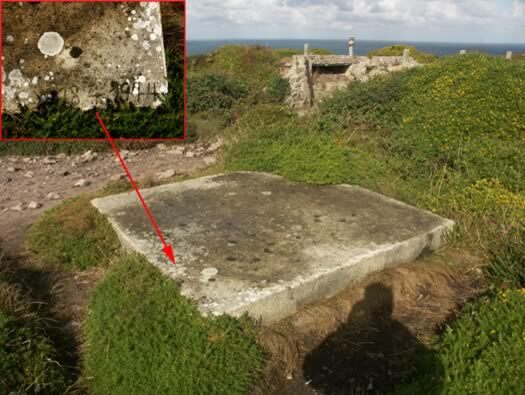 As you can see its cut out of the rock. 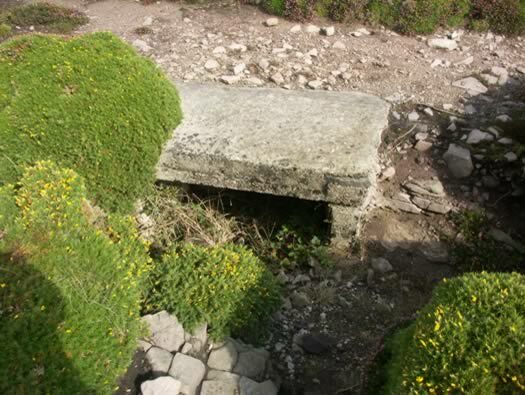 More trench bridges. 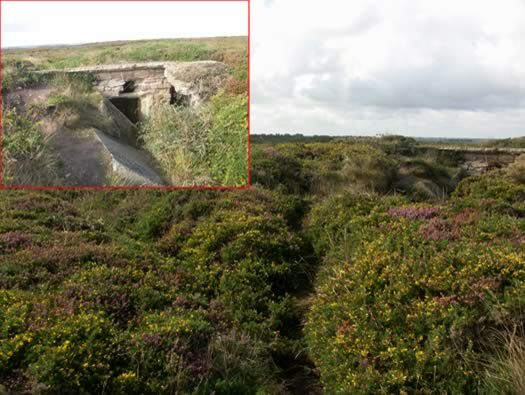 These are actually trench bridges to allow soldiers to move rapidly across the area without falling in the trenches. 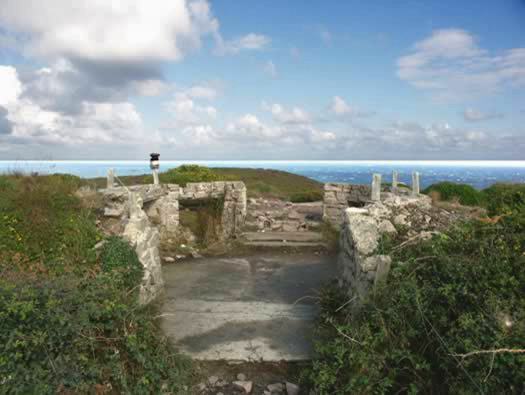 Section La318 Cap Frehel Pointe du Jas. Another Tobruk with a collar around It. A very Brittany Tobruk. 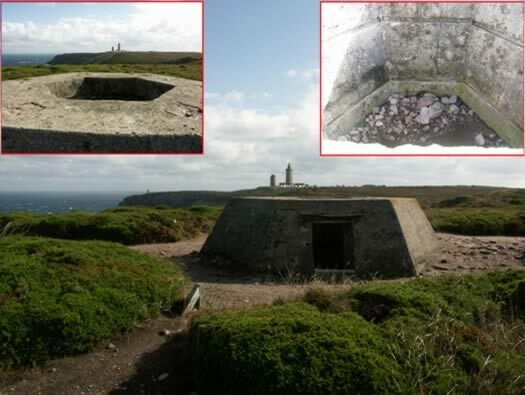 Close up of the Tobruk. Third Tobruk. 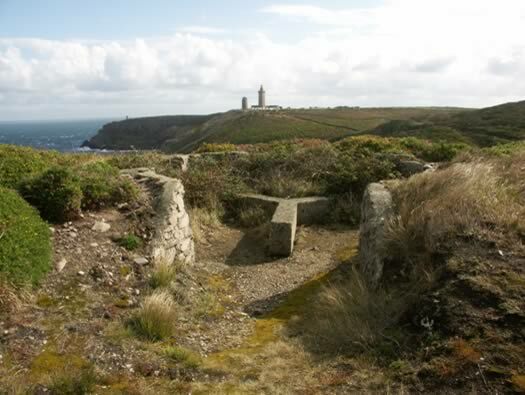 Trench leading into the Tobruk door. 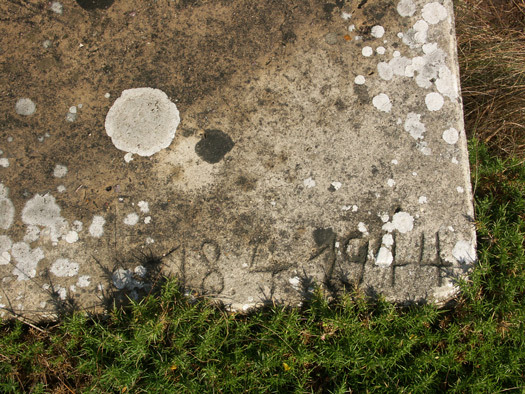 How did the gun stay on the concrete plinth when it was fired? Wasser, water reservoir. 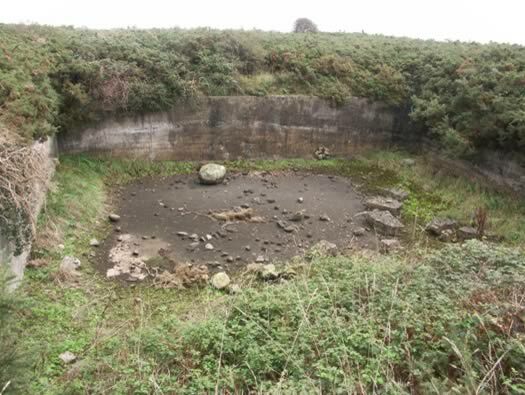 A concrete water reservoir. 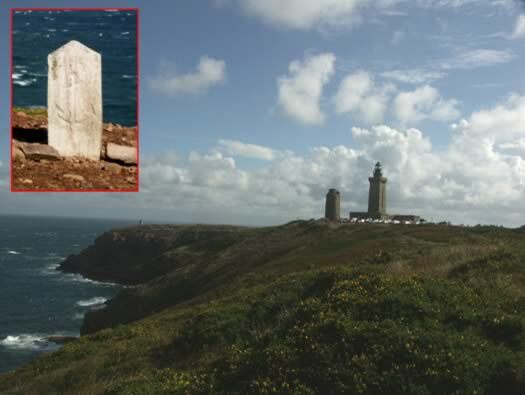 Inset a French Naval boundary stone. 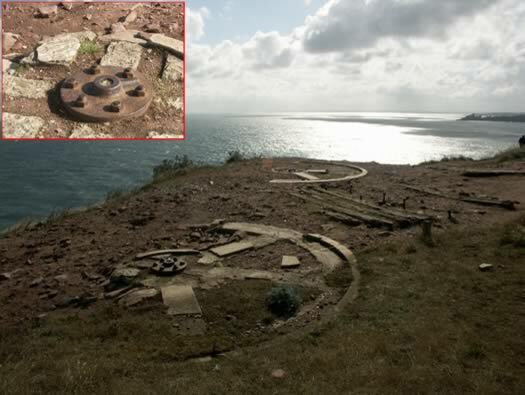 I found this base with a circle of bolts for 9.5cm Canon de Cote de 95 M93 French pre war guns..
Canon de Cote de 95 M93. More and heavier gun bases. 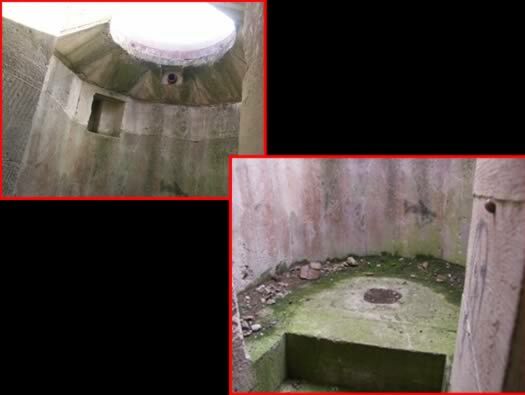 All from a pre war French battery position. One of the prettiest Norman/13cent. Castles. It was the place where they filmed Vikings with Kirk Douglas. 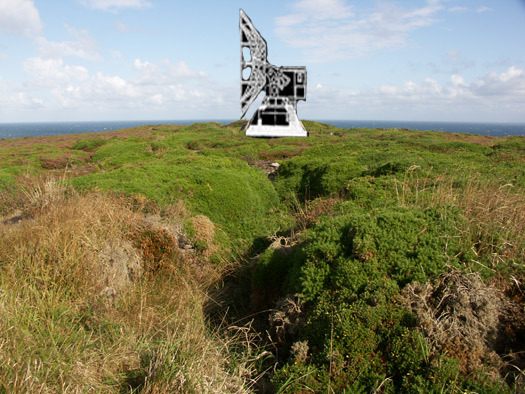 The allies had code names for this type of radar was 'Large Hoarding' a good name for it. Mammut FuMO52 on an L485(1) bunker. Allied drawing of Large Hoarding. 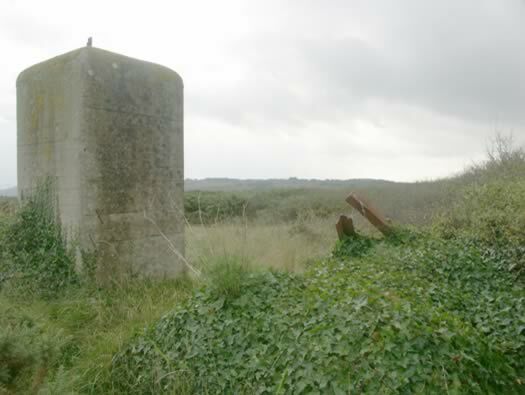 One of the concrete and steel supports for the large radar array. Aerial in its slot below. Holes in this concrete support from what look like aircraft machine guns or cannon shells. RAF Typhoons attacking ground targets. 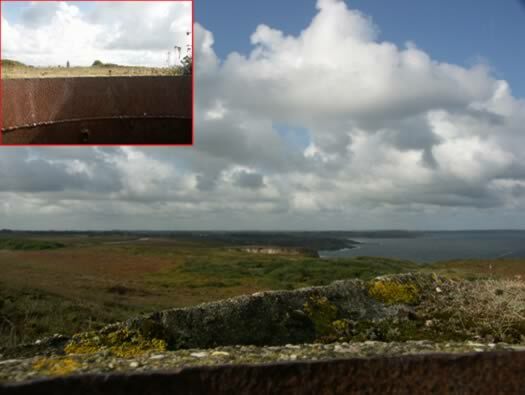 The view from under the close combat defence along the back wall showing one of the entrances and what looks like telephone cable brackets still in place. Not to be mistaken for an L485(2). 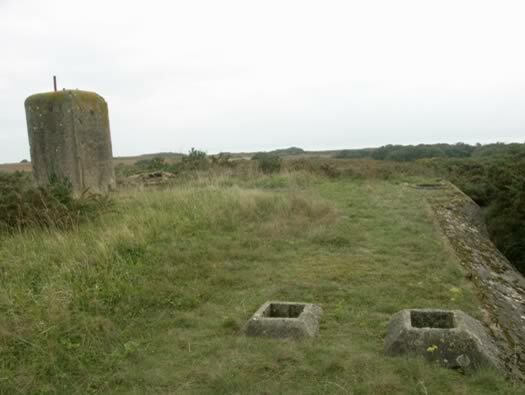 Entrance with the close combat defence where a machine gunner guard would stand and cover the entrance. Mammut FuMO52 L485(1) gas lock. 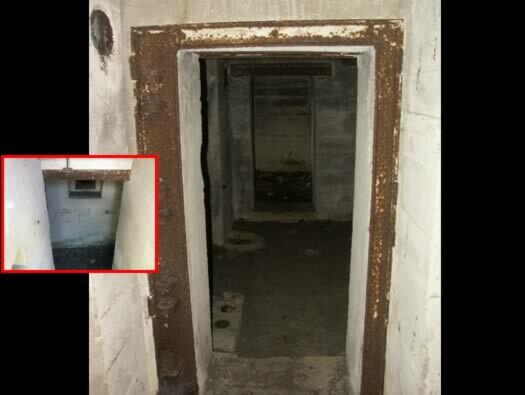 Entrance on the left, gas lock in front and left at the gas lock is the close combat/guard room. 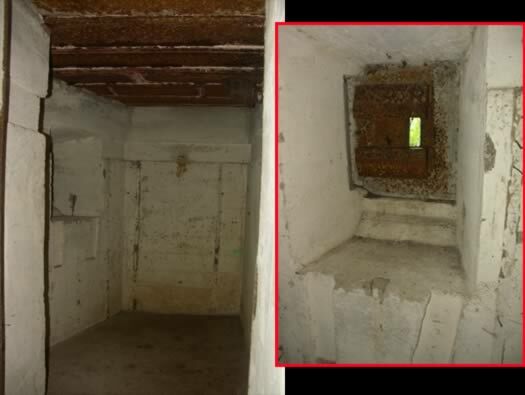 Close combat defence room or guard room. 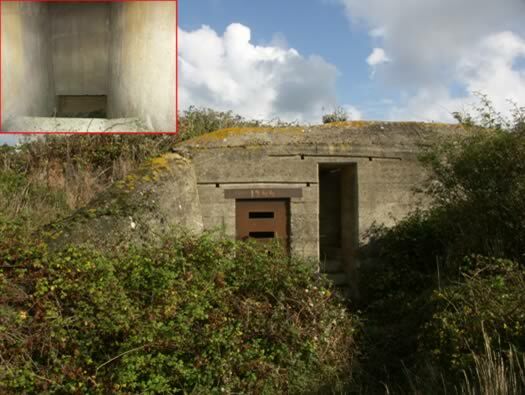 This is the main close combat defence room or guard room for the bunker could have looked. This is the close combat outside showing how it covers the back entrance. 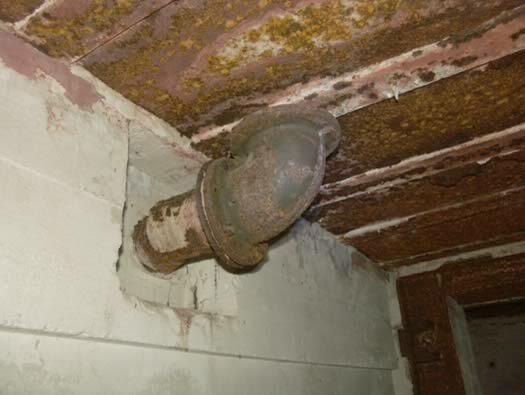 One of the pipes inside. Mammut FuMO52 L485(1) crew & ventilation room. The square hole is to pass messages through. Air filtration hand pump fitting, the metal ring on the wall is for spare filter storage. Filters stacked ready for use. 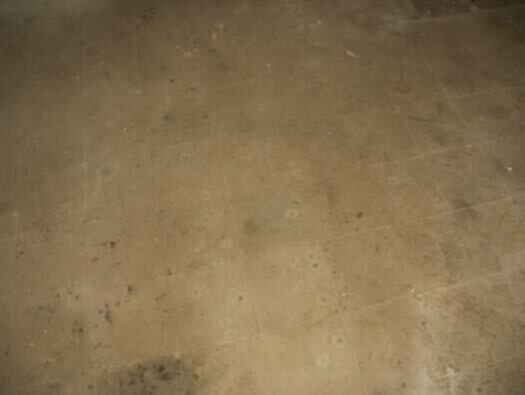 Thermo plastic tiled flooring to absorb shock and feel better on the feet. Here are some modern thermoplastic tiles that I polish to a high standard (Harts of Stur). Mammut FuMO52 L485(1) compensator room. Two compensator's, one for each deflector (that means an awfully lot to me!!). There were many large cables running through the buildings. Mammut FuMO52 L485 (1) compensator room. 1: Cable pipes for compensator No.1. These cables connect to the radar on the enemies side. 2: Cable pipes for compensator No.2. These cables connect to the radar on the opposite side. This is the compensator room looking at the entrance and the close combat window. 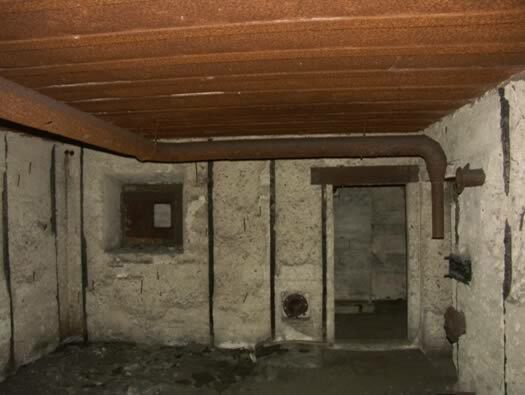 Door on the right to the crew/ventilation room. 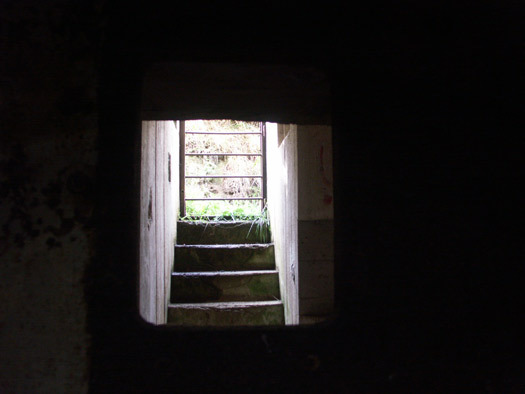 Entrance viewed through the close combat window. Mammut FuMO52 L485(1) emergency current room. 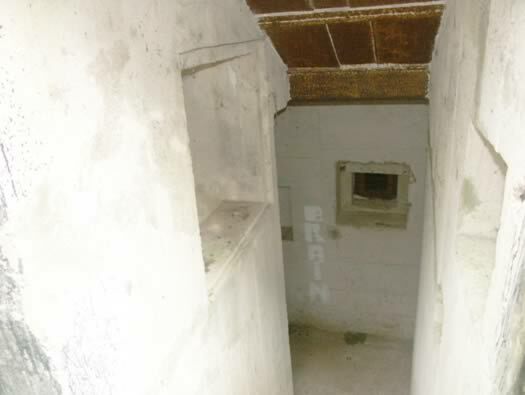 Emergency current room. Emergency generating room. Mammut FuMO52 L485(1) re-cooling room. 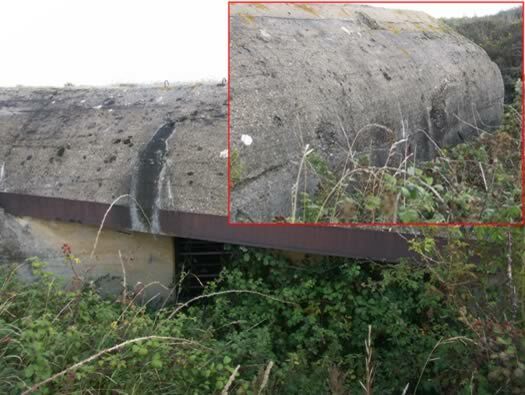 The view along the rear of the bunker with the close combat window embrasure covering the entrance. 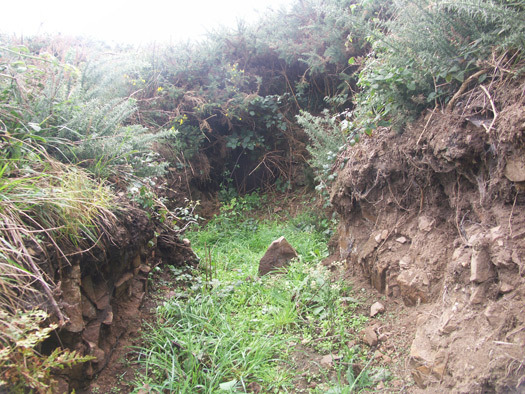 This trench outside the bunker continues away. 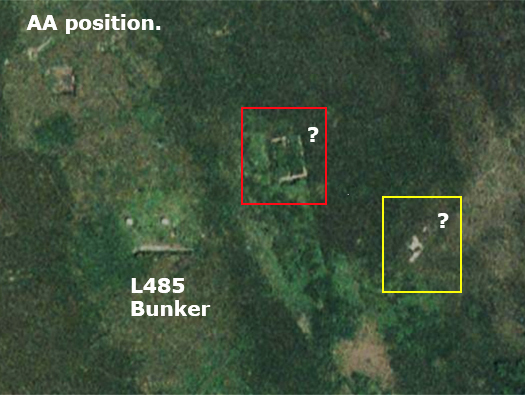 The area around the L485 Bunker. 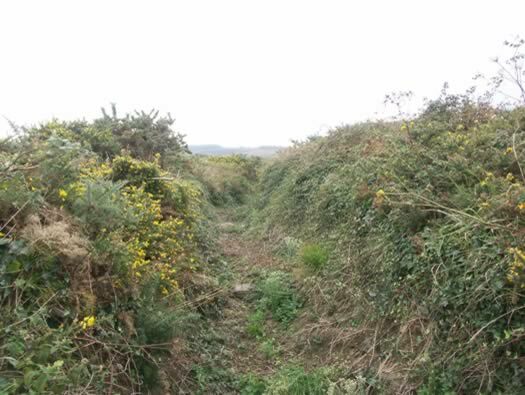 The trench in the last photo leads away towards the yellow square. 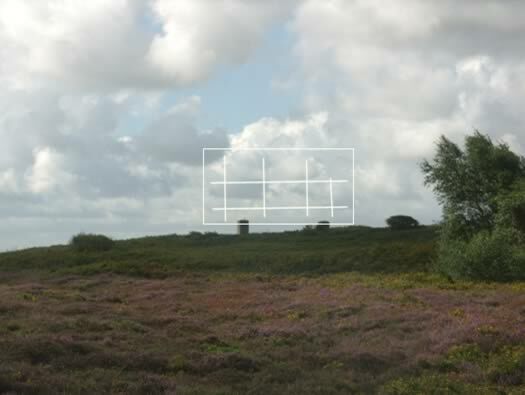 We did not venture into the heather and brambles to these buildings. 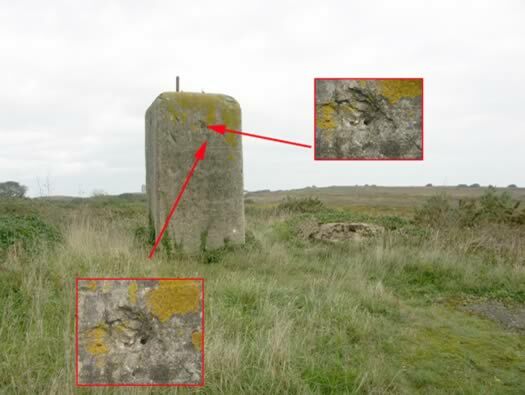 The Cap, the above picture is the area of the yellow square on the left. Brickwork on the side of the trench. 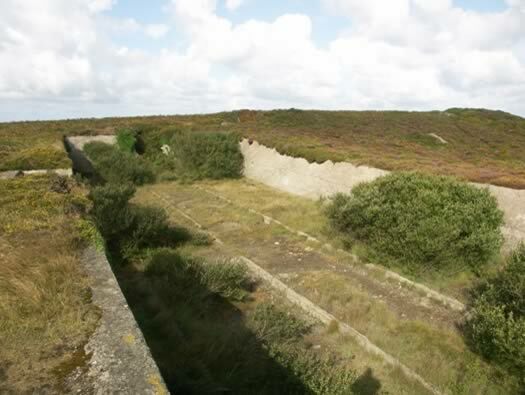 Trenches were dug out from the L485 to several emplacements, one of these trenches has been cleaned out and you can follow it to a 2cm AA gun emplacement. a plan of the bunker, trench, AA emplacement & a reservoir. .
2cm AA Emplacement. The gun sat on this mounting. Water was needed to cool the radars. 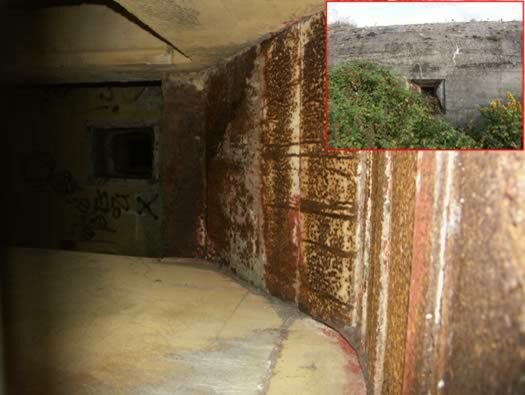 Flak position and the water reservoir.